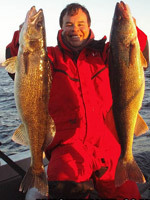 Top walleye fishing guides in Montreal recommended by Freshwater Phil. The Montreal area has a very healthy population of big walleye, with many specimens over the slot size for mandatory release. Bag limits of Walleye in the 2 lbs range (slot size) and a few up to 5 lbs can be expected on any given outing, and with some luck, you may be able to land a giant walleye on the 6-9 lbs range as well. 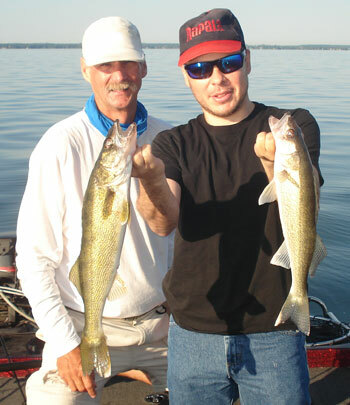 Walleye fishing guides will take you fishing for walleye at their hotspots, techniques include trolling, jigging, drifting, casting, or finesse fishing with drop shot rigs or tube jigs. Walleye fishing season opens in mid May after the spawn in our region, guided outings are available all the way through the open water season until winter, and then again thoughout the winter on ice. Best time: Mid June thru November. All gear and tackle provided. Daily rate: $475.00 Full Day, $375.00 half day. Rates based on 2 people, with 4 people max. Additional charge for extra persons.Tips welcome. Contact Mark about a guided fishing trip by clicking here. Boat specs: 19ft Lund, 150HP Verado /15 hp kicker, GPS/sonar. Techniques: Trolling, casting. Available time: Maid May through October. All gear and tackle provided. 3 people maximum. Daily rate: $400, tips welcome. Contact Mike about a guided fishing trip by clicking here.